Free Download Mac Theme for Windows 7. 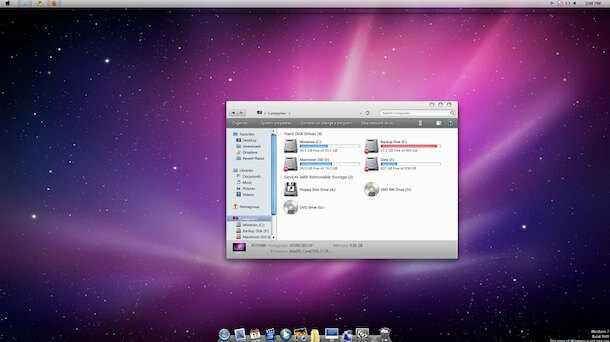 If you’re using a Windows 7 machine, why not make it look like Mac OS X? This task is made very easy with a theme/skin set called the Snow Transformation Pack, it turns your Windows 7 theme into a very convincing near complete Mac OS X interface including icons, wallpapers, the Dock, sounds, dialogue boxes, login screen, window skin, and more. Of course if you’re this obsessed with Mac OS, you should probably just buy a Mac and save yourself from the burden of Windows 7 and trying to skin it to look like a Mac, right?